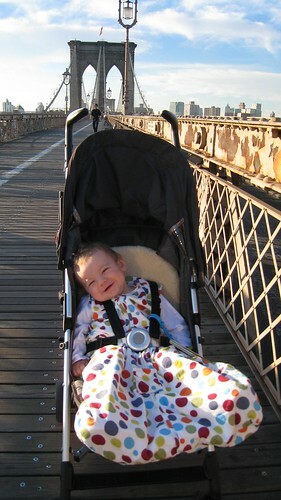 It was when my then 10-month-old son refused to go back to sleep one morning in July 2008 that I first crossed the Brooklyn Bridge. We were on holiday (vacation) staying in TriBeCa. On our second morning, the jetlag from flying from London not yet having worn off, he wouldn’t nod off again after waking up at 5am. 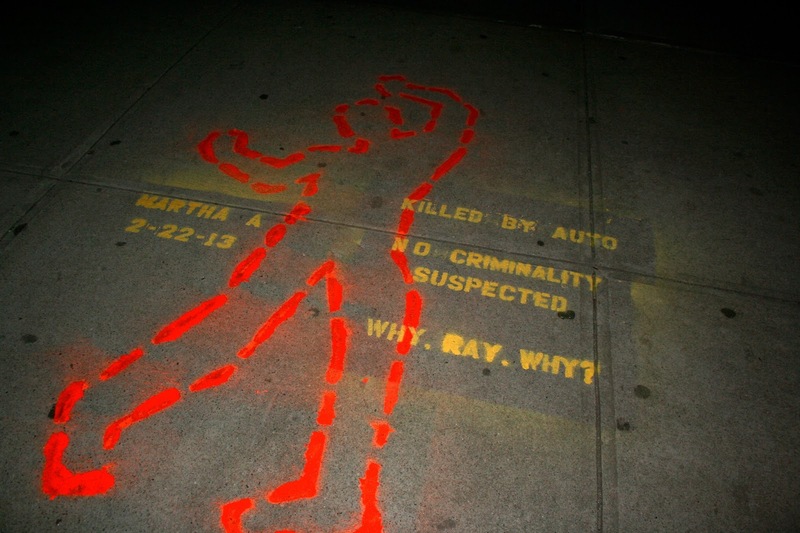 I’d headed south with him the previous morning, down towards the Staten Island ferry terminal. This time, I decided, it was about time I saw this bridge across the East River that I hadn’t properly seen on any previous visit to New York. Other old bridges in cities had shaped my expectations. 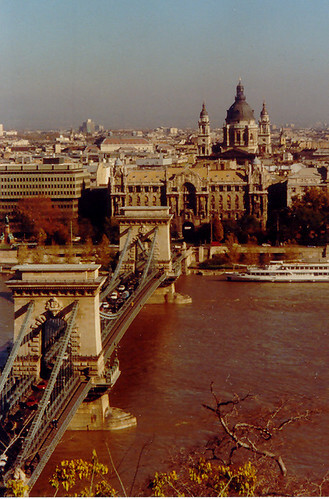 I’d cycled across the Chain Bridge in Budapest – another 19th century suspension bridge. I’d ridden over pretty much every Thames crossing between Tower Bridge and Windsor. I’d walked over the Clifton suspension bridge in Bristol. I had even noticed – with mild irritation – the numerous references in The Path Between the Seas, David McCullough’s fine history of the building of the Panama Canal, to the Brooklyn Bridge. He had written a previous book on the subject. How big a deal, I wondered, could a bridge across a river in the middle of a city be? All of which meant I was unprepared for what I encountered as I pushed my little boy’s pushchair (stroller) over the road beyond City Hall Park and started out on the long, sloping walkway. The twin archways of the bridge’s Manhattan pier stood hundreds of yards away, towering over even many tall New York buildings. The four enormous main suspension cables reinforced the bridge’s scale. This, I suddenly realised, was more like some vast, cross-estuary bridge – I’ve ridden in the past over the Erskine, Forth and Tay bridges in Scotland – than almost anything I’d previously encountered in a city. Yet it was nearly 100 years older than most of those similar spans and taking off from the middle of one of the most densely-packed sections of one of the most densely-packed cities on earth. I also, as I made my way out towards Brooklyn, started to notice the Manhattan-bound cyclists freewheeling down the slope. There were, it occurred to me, some lucky souls who got to commute by bike every morning over this marvel of engineering, taking in one of the world’s great views – lower Manhattan’s clustered skyscrapers. As I rolled the still wide-awake boy over the bridge, at an hour I’d normally still be sleeping, I started to imagine an alternative life from our existence in London. We would live in Brooklyn and I would get on my bike each morning and ride, amid the drama of the Brooklyn Bridge, to my job in Manhattan. There will by this point be many people familiar with cycling in New York puzzled at my enconium for this particular bridge – and for good reason. The Brooklyn Bridge, oldest of the fixed East River crossings and the most distinctive, suffers as a place to cycle from its celebrity. I have endured journeys on sunny Saturdays when I’ve spent virtually every yard of the main crossing ringing my bell, shouting warnings or braking suddenly as heedless tourists have wandered into my path. I had a young woman shout at me, “This is a tourist area!” after I tutted at her dumping her suitcase right in the cycle lane by the Manhattan pier. Her view failed, I thought, to capture the structure's fundamental bridge-iness. Most bizarrely of all, I once had a wedding party remonstrate with me that I was cycling too fast (at a sedate 12mph) and had disrupted their efforts to pose for wedding photos in the bridge’s bike lane. I suggested that, if they didn’t mind obstructing traffic, the view from one of the adjacent car lanes might be even better. But the challenges of using the bridge shouldn’t obscure how marvellous and unique a structure the bridge is. Using it can be one of those interactions with a city that cyclists are peculiarly privileged to enjoy. The bridge played a significant role in forming the current New York City. It's no accident that it was only in 1898, after the bridge's completion in 1883, that the cities of New York and Brooklyn merged to form one metropolis. a bit mad when you think about it. The aesthetics of the Great East River Bridge – as it was known during construction – also summarise something about the city itself. When John Roebling, the bridge’s designer, was planning it in the 1860s, he could easily have gone for a different look. There is, in retrospect, something eccentric about giving what was then the world’s most ambitious, modern bridge two twin stone archways in the European gothic style. The mixture of modern steel cables and gothic styling must initially have seemed as strange as, say, one of the modern-day shopping malls in Dubai themed around the medieval Muslim world. Yet the slightly pompous adoption of European styles and modern construction techniques turned out to be the perfect mixture for a city taking over from Europe the mantle of world leadership. There were buildings in New York and Brooklyn in an archaic style before the Great Bridge. But it’s hard to believe that mixture of old and new would have become quite as prevalent without the Roeblings’ bridge. Look at the Brooklyn Bridge’s towers and you’re seeing, right there, where Gotham City’s Gothic aesthetic was born. It helps that the bridge's mix of styles is unique. As McCullough's book points out, it was one of the first suspension bridges on such a scale – but the last big one before steel towers became standard. 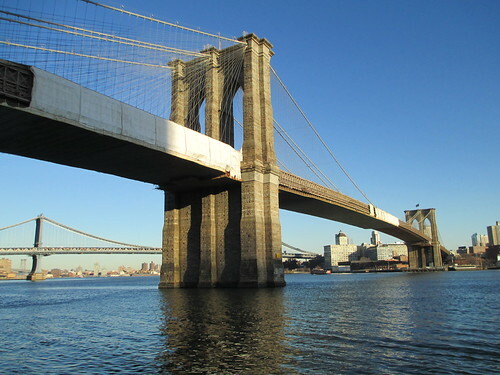 None of the Great Bridge’s East River successors features the mixture of stone and steel. A stop I made one morning in early March, however, has prompted me also to think about the human stories behind the bridge's construction as I ride across. Stopping to change from my warm cycling jacket to a cooler high-visibility vest, I spotted above where I rested my bike, on the bridge’s Brooklyn tower, the plaque that was unveiled on May 24, 1883 when the bridge, after 14 years’ work, finally opened to the public. Having read McCullough’s The Great Bridge since that day in 2008, I found many of the names bringing incidents during its building vividly to mind. The name John Roebling, the bridge’s original engineer, was marked with a small cross and the date 1869. He had, I knew, died slowly and painfully of tetanus after being injured surveying the bridge’s Brooklyn landing, on a spot almost precisely below where I stood. The cables above my head – a mixture of stays to hold the bridge deck steady and conventional suspension cables - bore testimony to his continuing influence. Such dual sets of cables were a trademark of his bridge designs – and testimony to his caution and thoroughness. The name Washington Roebling, John’s son, below him, conjured up still more stories. He suffered terribly for years from the effects – both on his nerves and his body – of tackling a fierce fire in the caisson that formed the base of the bridge’s Brooklyn tower. The caisson, complete with the wood he personally repaired, was on the river bed, directly below my feet. The list of the bridge’s trustees was less inspiring, meanwhile. 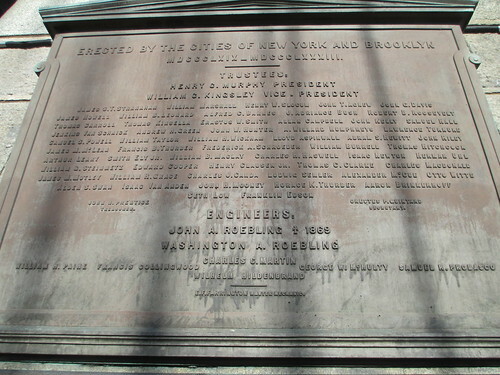 Henry Murphy and William Kingsley, the president and vice-president of the board, had both been involved in awarding the contract to make wires for the suspension cable to J Lloyd Haigh, a shady Brooklyn contractor. Haigh perpetrated a long-running fraud to supply the bridge with sub-standard wire. It was thanks to them that the cables whose width I'd noticed in July 2008 were so thick. Washington Roebling had added extra wire to them to protect against weaknesses in the sub-standard wire, still in place more than 130 years on. I looked at the plaque with far less insight back in 2008. My son had finally fallen asleep when I reached the Brooklyn pier and I turned back towards Manhattan, eager to suggest the Invisible Visible Woman and the Invisible Visible Girl come back with us for a second visit to the bridge. That second visit - and a picnic lunch the next day with two old friends in Fort Greene - further nurtured my growing idea of how we could live in New York. The notion of relocation to the Big Apple remained strong enough, even though the prospects of its happening seemed remote, that I rhapsodised on the possibility of commuting over the Brooklyn Bridge in the first post on this blog. The notion made me all the keener to apply when, unexpectedly, a suitable job with my employer in New York became available. 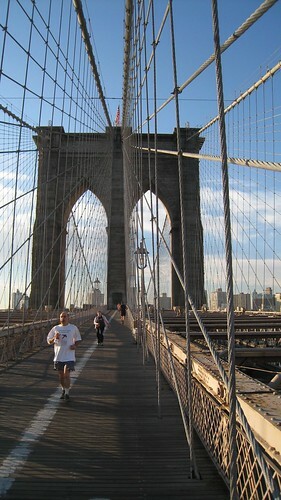 Yet there was no inevitability about my using the Brooklyn Bridge, even once we'd selected a Brooklyn apartment. 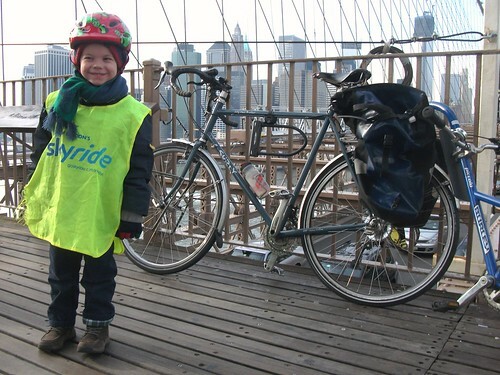 My early research revealed a strong bias among cyclists in favour of using the pedestrian-free Manhattan Bridge bike path to travel between downtown Brooklyn and lower Manhattan. I’ve used all three other East River bridges – the Manhattan for trips to Lower East Side destinations, the Williamsburg for an occasional change and the Queensboro for a few days following Superstorm Sandy. But, unlike the others, I eventually realised, the Brooklyn Bridge would land me in the middle of lower Manhattan, less than half a mile from the Hudson River Greenway and four miles of convenient, traffic-free riding uptown. As a result, I am now one of those lucky souls I spotted freewheeling off the bridge in 2008. I’ve ridden when snow is accumulating on the wooden walkway and in torrential rain, as well as suffocating heat and on days of such wind I’ve walked over the bridge’s centre. I’ve seen days when fog obscures Manhattan from Brooklyn, those when mist collects in the Manhattan streets and the skyscrapers poke out up above and days when rain on my glasses obscures the whole scene. I’ve cursed the wood's slipperiness on wet days and the walkway's narrowness on sunny days that bring out the tourists. On one especially memorable evening, I rode home over the bridge as spectacular thunderstorms broke over New York Harbour, periodically highlighting the buildings around me against great flashes of sheet lightning. Through all of that, there are still days – frequent ones, in fact – when the highlight of my ride to work is the moment when I turn a corner on the walkway and the bridge first comes into view. The Roeblings’ twin gothic towers come into view against a backdrop of lower Manhattan skyscrapers glistening in the sunlight – and I remember what made me want to live in this city in the first place.